Marco Freyr, in between his densely researched articles on Barrel-Aged-Mind, indulges himself with tasting independent bottlers’ wares, all at cask strength. Marco does not waste time with the featherweight Bacardis of this world – he goes straight for the brass ring, and analyzes his rums like he was a Swiss watchmaker looking for flaws in the Vacheron Constantin Reference 57260. Some time back he shipped me some Bajan fullproofs – being amused, perhaps, at my earlier work on Mount Gay’s XO, and feeling I should see what others did with their juice, both now and in the past. This is not to diminish Richard’s or the Warren’s output – yeah, right – simply to call attention to decent rums made elsewhere on the island, which was the same line of reasoning behind my writing about the Banks DIH rums from Guyana to contrast against the DDL stuff. Anyway, in that vein here’s the second of a few full proof rums from Little England I want to run past you. This one is also from Cadenhead — not one of their M-for-massive iterations that knock you under the table and leave the weak-kneed trembling and crossing themselves, but from the Green Label collection. A 2000-2010 ten-year-old bottling, issued at a relatively mild 46% and therefore much more approachable by those who prefer standard-proof rums. I’m not always a fan of the Green Labels – their quality is inconsistent, as the Laphroaig-aged Demerara implies and the 1975 Demerara emphatically refutes – but there aren’t that many Bajan rums out there made by the indies to begin with (aside from FourSquare’s juice), so we should take at least try one or three when they cross our path. Nose first: for a ten year old aged in Europe, it was quite fruity and sweet and the first smells that greeted me were a mild acetone, honey and banana flambee, with spices (nutmeg and cloves), some fruitiness (peaches, pears) and caramel. Allowing for the difference in power, it was similar to the BMMG we looked at last week, though its nasal profile whispered rather than bellowed and lacked the fierce urgency that a stronger ABV would have provided. The fruits were overtaken by flowers after some minutes, but throughout the tasting, I felt that honey, caramel and bananas remained at the core of it all, simple and distinct. To some extent this continued on the tasting as well. With a strength of 46% the Green Label didn’t really need water, as it was light and warm enough to have neat (I added some later) and the golden rum didn’t upend any expectations on that score. It was initially very sippable, presenting both some brine and some caramel sweet right away, right up to the point where – what just happened here? – it let go a series of medicinal, camphor-like farts that almost derailed the entire experience. These were faint but unmistakeable and although the subsequent tastings (and water) ameliorated this somewhat with green tea, a little citrus, more honey, caramel, and chocolate, it was impossible to ignore completely. And at the close, the 46% resulted in a short, breathy finish of no real distinction, with most of the abovementioned notes repeating themselves. I’ve had enough FourSquare rums, made by both them and the independents, to believe that Marco was correct when he wrote that he doubted this rum was from them, but instead hailed from Mount Gay – much more than Doorly’s or Rum66 or the more recent FS work, it shared points of similarity with the Cadenhead’s BMMG cask strength as well as the 1703 from Mount Gay itself. And like him, I thought there was some pot still action coiling around inside it, even if Cadenhead obdurately refused to divulge much in the way of information here. At the end, though, whatever the source, I didn’t care much for it. With the BMMG I remarked it was too raw, perhaps too strong for its (continental) ageing and could use some damping down, a lesser strength – not something I say often. Here, to some extent the opposite was true: it was mild and medium-sweet, floral and fruity and had it not been for that blade of medicine in the middle, I would have rated it quite a decent Bajan rum, a credit to Mount Gay (if not entirely rivalling the 1703). As it was, combined with the overall lack of punch and depth, it finishes as a rum I’d not be in a hurry to buy again, because it’s too deprecating to qualify as a fullproof bruiser and the taste doesn’t take up enough of the slack to elevate it any further. Marco’s unscored 2012 German-language review, from the same bottle as the sample he sent me, can be found on his wesbite, here. Think of the great and noble Demerara rum marques and a few initials come to mind. PM. EHP. VSG. ICBU. PDW. I spent days trolling around trying to find out what those initials meant and came up dry. 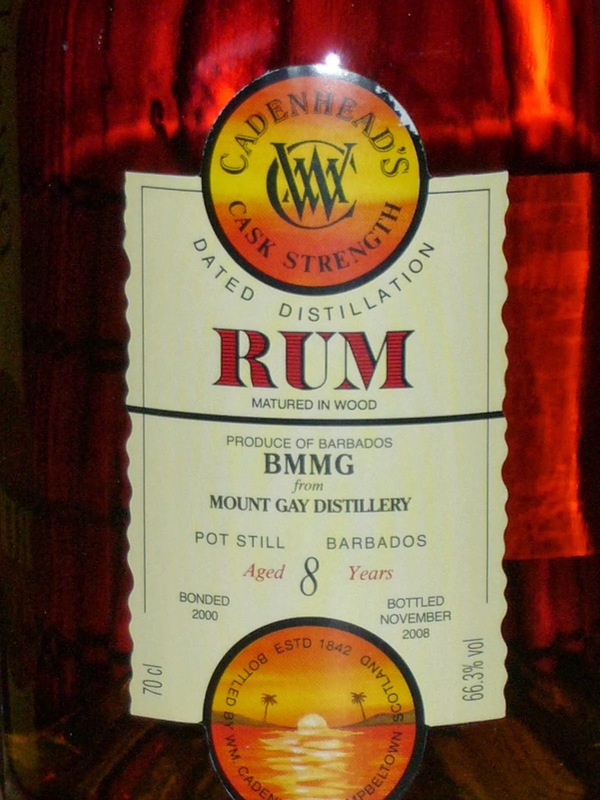 I was left thinking that if Cadenhead doesn’t get its act together, it’s going to be a running joke that they’re clueless as to how to name their rums, and maybe I’ll solicit lottery entries for best guess what these initials represent. But that’s just me and somewhat irrelevant, so let’s just rewind to the beginning. 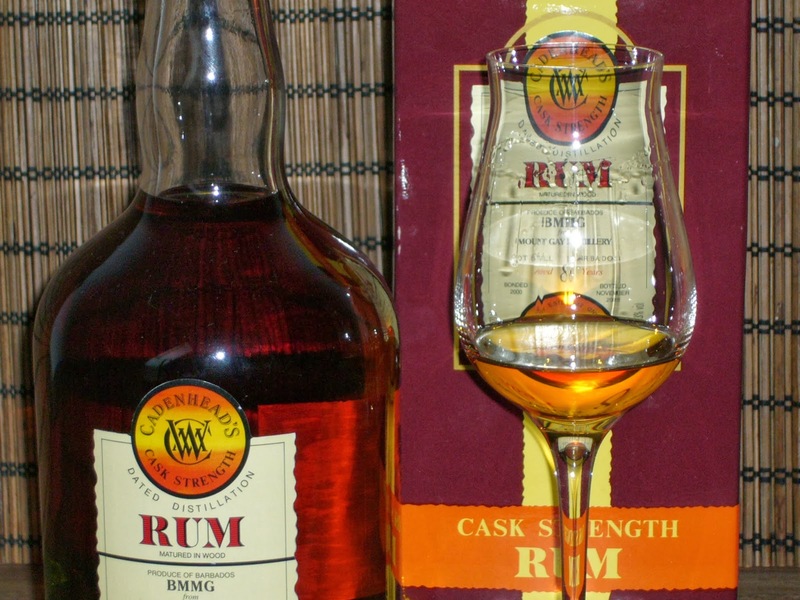 Caribbean Distillers Limited was and is not a distillery of any kind, merely a now-dormant subsidiary of DDL (Yesu Persaud and Komal Samaroo were/are its officers), incorporated in the UK in 1986 with £100 share capital. It seems reasonable to assume it was the distribution arm for DDL in Europe, or a vehicle for financial transactions which would have been difficult to carry out from Guyana, where extremely stringent exchange controls existed at that time. So by the time Cadenhead bought their barrel(s) it was from this company which in turn had access to all of DDL’s exported aged rums. The most common geriatrics one can still find (and, perhaps, afford) are those from the 1970s made in limited runs by the whisky makers – we’re not all like Uncle Serge, who just reviewed the Samaroli 1948 Longpond the other day. And, yes, of course even older ones do exist — the Saint James 1885 proves that — but they’re usually far too pricey and in many cases just made in some far away time, and are not normally thirty or forty years old. So it was with some appreciation that I sprung some of my hard earned cash to buy a sample of this hoary 29 year old Cadenhead, dating back from 1972, and bottled at a whopping 60.9%. You gotta love those Scots – as far back as 2002, way before us writers were even out of rum-diapers and we all and only loved living room strength, they were out there pushing fullproof mastodons. Is it worth it, if one can find it? I suggest yes, and for those of you who are shrugging (“Ahh, it’s just another strong rum”), well, I’ll just dive straight into the tasting notes and maybe that’ll hold your waning attention. Certainly nothing else would express my appreciation quite as well. Starting with the nose, it was aggressive and spicy but without any serious damage-inducing sharpness redolent of massive pot still crazy – in fact, it presented almost creamily, with coconut shavings, vanilla, exotic baked fruit in a cream pie (think a steroid infused lemon meringue), and the vague delicacy of flowers rounding out the backend. With water it opened up spectacularly: it went all citrusy, tartly creamy, very fruity, tacking on some licorice – I was left looking wonderingly at the amber liquid in the glass, wondering what on earth this really was: a Port Mourant? Emore? John Dore? For my money it’s the single wooden pot still (VSG marque), because it lacks some of the depth of the PM and I had enough Enmores to believe it wasn’t that. But that’s only a guess really, since nobody knows what the PDW stands for. Anyway, I was equally pleased (enthused might be a better word) with the taste, which was, quite frankly, an edged weapon of dark rum magic. Everything I liked in a Demerara rum was here, and in great balance without excess anywhere. First there were prunes and other dark fruits – raisins, blackberries, blackcurrants. To this was added licorice, slightly bitter-and-salty burnt sugar and caramel. Oakiness was kept way back – it was a breath, not a shout. These core flavours were circled by sharper citrus notes, as well as some of that lemon meringue again; faint green grapes, some apples, and a pear or two, nothing serious, just enough unobtrusive small flavours tucked away in the corner to garner appreciation for the rum as a whole. And while forceful, the 60.9% was really well handled, leading to a heated finish redolent of much of the above (and nothing markedly different, or new) that went on for so long I nearly feel asleep waiting for it to stop. In short, this was a magnificently aged rum. Maybe I should be genuflecting. So far, just about all rums from the disco decade I’ve tried have been very old ones (not necessarily very good ones in all cases), aged two decades or more, bottled at the beginning of the rum renaissance in the 2000s. There’s Velier’s PM 1974 and Skeldon 1973, Norse Cask 1975, Cadenhead’s own Green Label 1975 Demerara, and a few others here or there….and now this one. 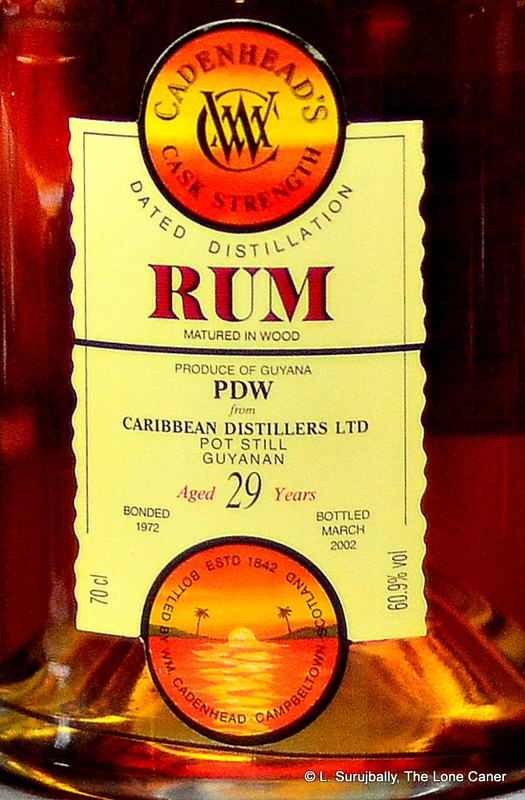 The PDW is a big, growly, deep, tasty rum, and if you’re tired of Veliers, go see if you can find it. It’s a triumph of the maker’s imagination and the difficulties of ageing that long. It couldn’t have been easy to make, or decide when to stop, but Cadenhead seems to have kept at it and at it, and waited to bottle the thing only when they were sure, really sure, they had it absolutely right. And they did. The Sancti Spiritus distillery in Central Cuba, also known as Paraiso, has been making rums since 1946, and other than its history (see “other notes” below) there is remarkably little hard information about its operations, its size, volume or exports on hand. Aside from what must be substantial local production which we don’t see, they may be better known for the relatively new Ron Paraiso brand, as well as from the labels of independent bottlers like Compagnie des Indes, Kill Divil, Bristol Spirits, the Whisky Agency, and, here, W.M.Cadenhead. Based on what one sees for sale online, barrels seem to have begun hitting Europe somewhere around the mid 1990s, with the one I’m looking at today coming off the (columnar) still in 1998 and bottled at a firm 59.2% in 2013. 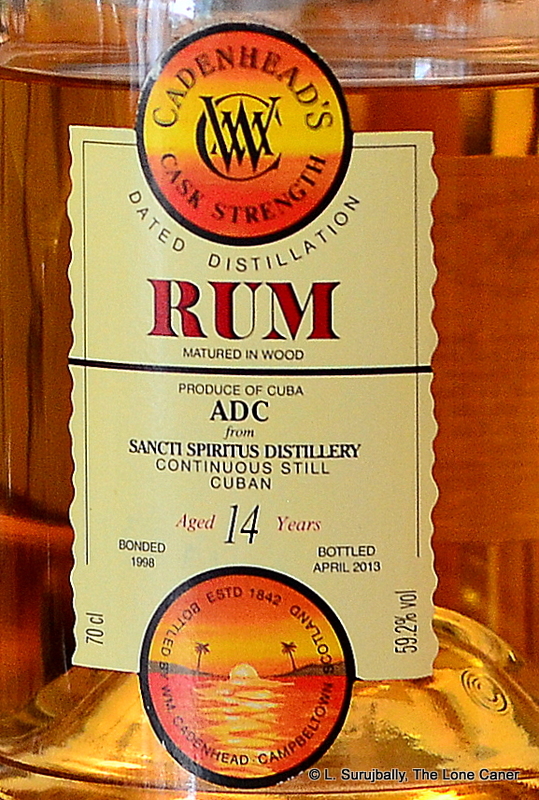 Cadenhead, as usual, have amused themselves with putting the abbreviation “ADC” on the label, which could mean variously “Aroma de Cuba,“ or “Acerca de caña” or, in my patois, “All Done Cook” – any of these could be used, since Cadenhead never discloses – or doesn’t know itself – what the initials denote, and I’m tired of asking and getting “Ahhhh…duuuuh….Cuba?” in response. A number of people who like the heavier, thrumming British West Indian rums (from Jamaica, Guyana, and Barbados for example) have sniffed disparagingly to me about Spanish rons recently, especially the column still ones, which are most of them. I suspect this has to do with their despite for Bacardi and the light Panamanian stuff that’s been slipping in the ratings of late. Nothing wrong with that, but my own feeling is that they’re casting too wide a net, and if one throws out an entire region’s worth of bathwater based on a few sampled rums, then one misses the baby that washed out the door as well. Maybe it’s the occasional lack of verifiable ageing, maybe it’s the lightness, maybe it’s the palate of the drinker. Don’t know. But this Cuban ron does deserve a closer look. Consider first the nose on the pale yellow ron: it was a sparkling, light dose of crisp, clean aromas, starting off with rubbery, sweet acetones all at once. In its own way it was also quite tart, reminding me of gooseberries, pickled gherkins, cucumbers and lots of sugar water, stopping just short of presenting an agricole profile. I don’t think I could have sipped it blind and known immediately it was from Cuba. At a whisker shy of 60% it attacked strongly, but was too well made to be sharply malicious, and was simply and forcefully intense, which was to its credit and made the experience of smelling it a very good one, especially once some soursop, citrus and baking spices were coaxed out of hiding a few minutes later. The taste fell down somewhat – there was dry wood, a lot of strange and almost-bitter tannins at the start; which was fortunately not a disqualification, because these tastes balanced off what might otherwise have been an overabundance of light sweetness represented by watermelon and papaya and Anjou pears. Gradually it unfolded like a flower at dawn, producing additional faint notes of orange zest, almost-ripe yellow mangoes and apricots, balanced by iodine, menthol (!! ), tumeric and some strong black tea, all of which led to a conclusion that was suitably long, clear and spicy, closing off the show with nutmeg, more of that tartness, and a flirt of orange zest. Briefly, Cadenhead’s ADC stacked up well against a raft of agricoles, Spanish and Surinamese rums that were on the table that day. It did make me think, though: reading around others experiences with Cuban rums generally, one thing that strikes me as consistent is that the demonstrably older a Cuban rum is, the more commonly it is scored high. Now pot still rums made with some skill can be good right out of the gate, and creole column-still juice out of the French islands prove all the time that higher age does not necessarily confer higher praise (or scores). But with column still rums made in the Cuban/Spanish style, the usual easy 40% young stuff or blended rons of some age just don’t have that sizzle which Cadenhead somehow extracted out of their barrel here. In other words, for such traditionally light rums, additional ageing is a better deal, it would seem. So, in fine, I believe that this rum is better than the Havana Club Barrel Proof (and the Seleccion de Maestros that succeeded it), better than the Renegade 11 year old (but maybe I should retaste since I tried that one ages ago); it edges out the Santiago de Cuba 12 year old, though is perhaps not quite as good as the CDI Sancti Spiritus (also from 1998). Those dour Scots took the sunshine of the tropics, doused it with some cold salt sea-spray and foam-lashed rocks, and produced an amalgam of both that’s better than either, and just falls short of remarkable – it’s worth a try by anyone, if it can still be found. A few words on the distillery history: called variously the Paraiso or Sancti Spiritus distillery, the founding family, the Riondas, began their sugar business in 1891 with a company called the Tuinucú Sugar Company in the province of Sancti Spiritus (which was also near to the original Bacardi distillery). In 1946 the Paraiso Distillery was created and in 1951, the Tuinucú Sugar Company was consolidated into both plantation and distillery operations. Since the revolution, the Government took over the entire operation not long after and has run the show ever since. It’s instructive to drink the Norse Cask and the Cadenhead in tandem. The two are so similar except in one key respect, that depending on where one’s preferences lie, either one could be a favourite Demerara for life. The online commentary on last week’s Norse Cask 1975 32 year old rum showed that there was and remains enormous interest for very old Guyanese rums, with some enthusiasts avidly collecting similar vintages and comparing them for super-detailed analyses on the tiniest variations (or so the story-teller in me supposes). For the benefit of those laser-focused ladies and gentlemen, therefore, consider this similar Cadenhead 33 year old, also distilled in 1975 (a year before I arrived in Guyana), which could have ascended to greatness had it been stronger, and which, for those who like standard strength rums of great age, may be the most accessible old Demerara ever made, even at the price I paid. The dark mahogany-red Cadenhead rum was actually quite similar to the Norse Cask. Some rubber and medicinals and turpentine started the nose party going, swiftly gone. Then the licorice and tobacco — of what I’m going to say was a blend with a majority of Port Mourant distillate — thundered onto the stage, followed by a muted backup chorus of wood, oak, hay, raisins, caramel, brown sugar. I sensed apricots in syrup (or were those peach slices?). 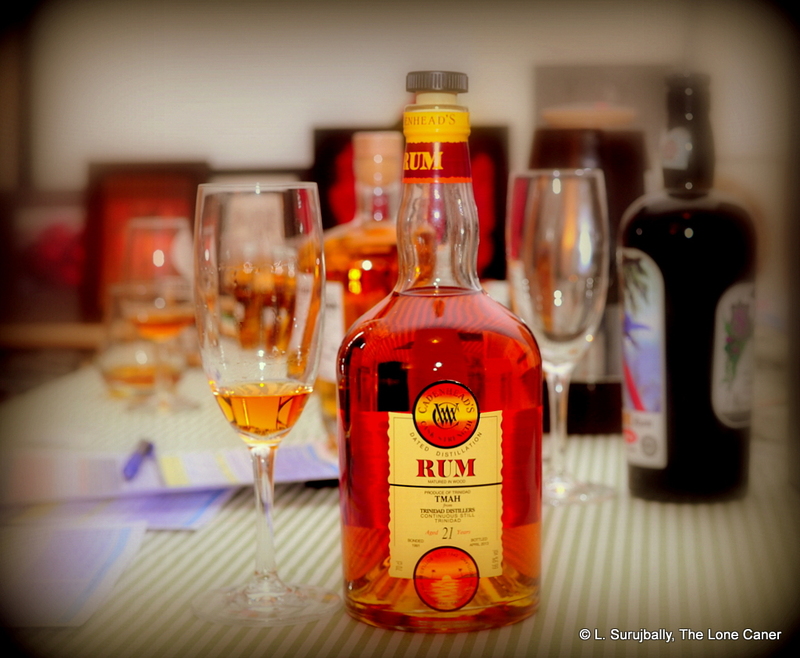 It’s the lack of oomph on the strength that made trying the rum an exercise in frustrated patience for me. I knew the fair ladies were in there…they just didn’t want to come out and dance (and paradoxically, that made me pay closer attention). It took a while to tease out the notes, but as I’ve said many times before, the PM profile is pretty unmistakeable and can’t be missed…and that was damned fine, let me reassure you, no matter what else was blended into the mix. The palate demonstrated what the Boote Star 20 Year Old rum (coming soon to the review site near you) could have been with some additional ageing and less sugar, and what the Norse Cask could have settled for. The taste was great, don’t get me wrong: soft and warm and redolent with rich cascades of flavour, taking no effort at all to appreciate (that’s what 40.6% does for you). It was a gentle waterfall of dark grapes, anise, raisins, grapes and oak. I took my time and thoroughly enjoyed it, sensing even more fruit after some minutes – bananas and pears and white guavas, and then a slightly sharper cider note. The controlled-yet-dominant licorice/anise combo remained the core of it all though, never entirely releasing its position on top of all the others. And as for the finish, well, I wasn’t expecting miracles from a standard proof rum. Most of the profile I noted came back for their final bow in the stage: chocolate muffins drizzled with caramel, more anise, some slight zest…it was nothing earth-shattering, and maybe they were just kinda going through the motions though, and departed far too quickly. That’s also what standard strength will do, unfortunately. That this is a really good rum is not in question. I tried it four or five times over the course of a week and over time I adjusted to its calm, easy-going voluptuousness. It’s soft, easygoing, complex to a fault and showcases all the famous components of profile that make the Guyanese stills famous. If one is into Demerara rums in a big way, this will not disappoint, except perhaps with respect to the strength. Some of the power and aggro of a stronger drink is lost by bottling at less than 41% and that makes it, for purists, a display of what it could have been, instead of what it is. I suggest you accept, lean back and just enjoy it. Neat, of course. Ice would destroy something of its structural fragility, and mixing it might actually be a punishable offense in some countries. The word “accessible” I used above does not mean available, but relatable. The majority of the rum drinking world does not in fact prefer cask strength rums, however much bloggers and aficionados flog the stronger stuff as better (in the main, it is, but never mind). Anyway, most people are quite comfortable drinking a 40-43% rum and indeed there are sterling representatives at that strength to be found all over the place. El Dorado’s 21 year old remains a perennial global favourite, for example – and that’s because it really is a nifty rum at an affordable price with an age not to be sneered at (it succeeds in spite of its adulteration, not because of it). But most of the really old rums for sale punch quite a bit higher, so for those who want to know what a fantastically good ancient Demerara is like without getting smacked in the face by a 60% Velier, here’s one to get. 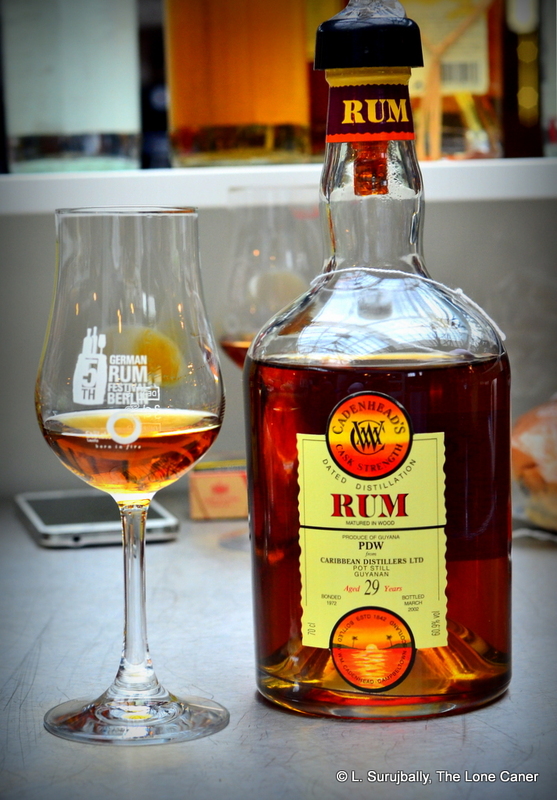 It’s a love poem to Guyanese rums, reminding us of the potential they all have. Distilled 1975, bottled October 2008. Outturn is unknown. The actual components and ratios of the blend is also not disclosed anywhere. 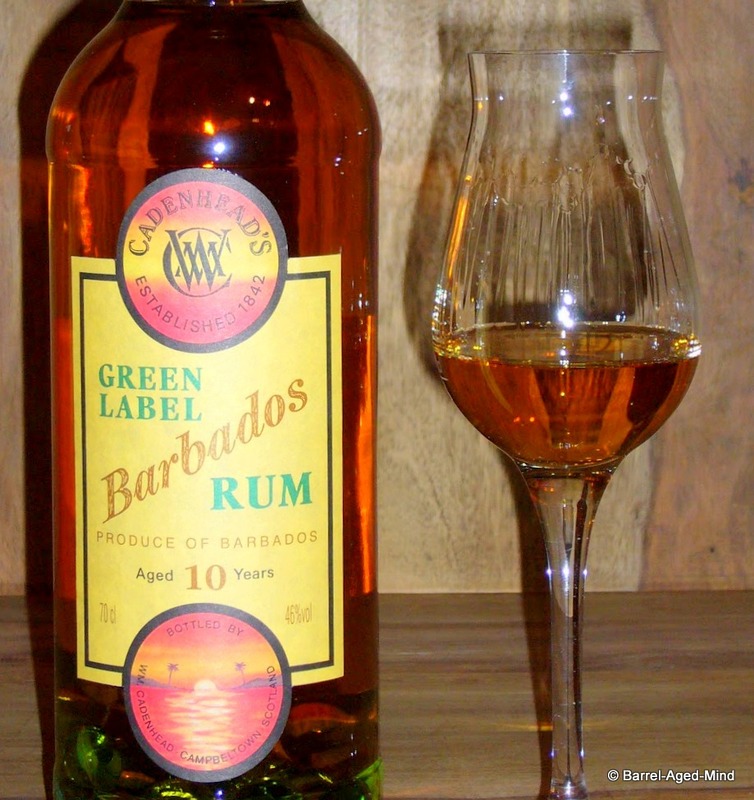 Green Label Demerara 30 YO (1975 – 2005), 40,5% vol. 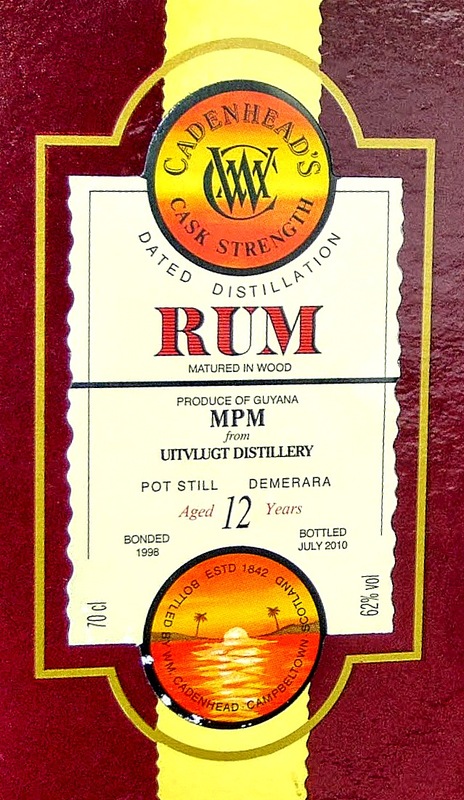 Green Label Demerara 32 YO (1975 – 2007), 40,3% vol. 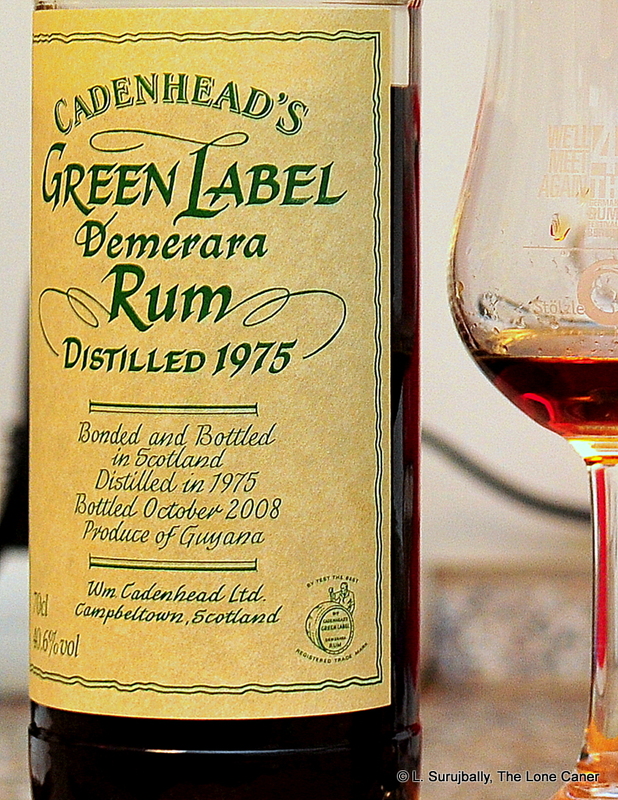 Green Label Demerara 33 YO (1975 – 2008), 40,6% vol. 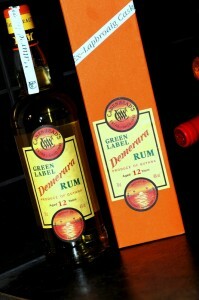 Green Label Demerara 36 YO (1975 – 2012), 38,5% vol. A Spartan rum, sporting a massive codpiece, ripped eight-pack, and real attitude. Not for the lovers of softer or sweeter fare. You just gotta shake your head with appreciation when you regard Cadenhead and their commitment to muscle-bound zen machismo in rums. They’ve always had a certain retro charm and a daring to go off the reservation that I grudgingly admired, and they have continued along that path here with this monster full proof. Leaving aside the squat, glowering psycho-orange-and-yellow bottle with its cork stopper which is almost a Cadenhead signature, it should simply be noted that Cadenhead hewed to their minimalist ethos and added nothing in, and filtered nothing out. In some previous iterations they tremulously diluted to drinking strength (whatever that might mean), but not here – perhaps they wanted the TMAH to take Velier out back and beat the snot out of it. It’s bottled at 66.9% – a hilariously strong drink, a growlingly full-proofed rum that wants to land on your glottis like a blacksmith’s solid iron anvil. I had been softened by several forty percenters, sampled prior to cracking this one, and was consequently somewhat unprepared for the force with which the TMAH assaulted my beak (it was sharp and deep, and should absolutely be left to stand for a while before nosing). I could barely discern any molasses background at all, in between furiously swirling notes of rye bread, salt biscuits and salt butter. Not much caramel here. But patience, patience – it did get better. After opening up, it smoothened out a good bit and simply became an intense drink rather than a skewering one – and one could gradually tease out thin threads of honey and nougat, and sweeter notes of vanilla, cherries…and a little spicy note of marzipan. That didn’t soften the arrival, of course. It was a little less than medium bodied, this rum – even thin, which I didn’t care for – and it detonated with a hurricane force level of taste, scattering shrapnel of sweet and salt in all directions. Dates and figs came to mind, more crackers, a sharp aged cheddar (but not as creamy). Adding water helped here: almonds, nutmeg and slivers of dried fruit emerged, but slowly, thinly, as if terrified of being bludgeoned to death by the alcohol. “Chewy” would not describe the experience exactly, but it comes close. Appropriately enough for such a full proof glass of high-test, the finish was enormously long, a sarissa of lingering flavours of nutmeg and vanilla and light sharp red fruit (pomegranates?). Cask strength, overproof, full proof or whatever – it was certainly a rum that demanded attention. 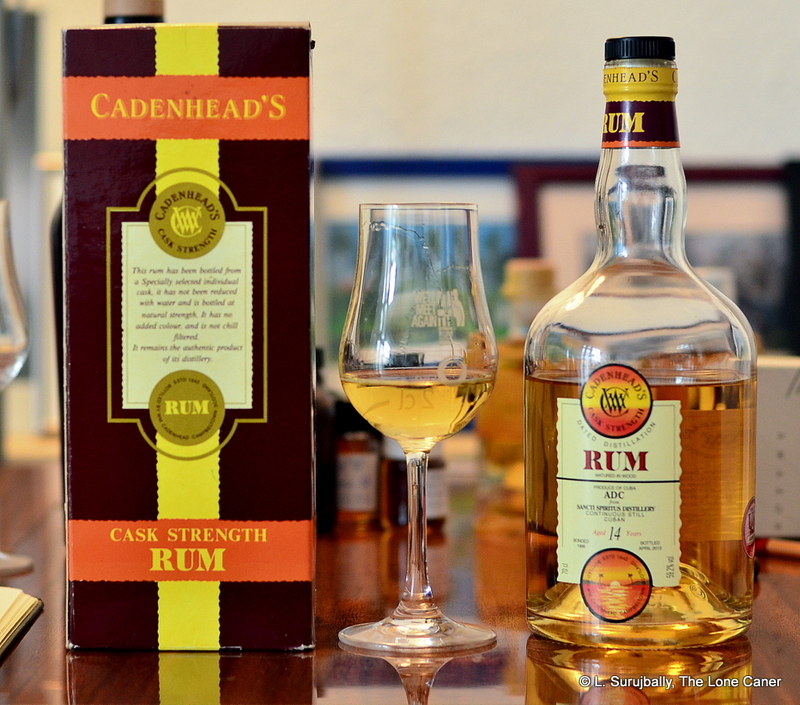 A rum like Cadenhead’s 21 year old is a curious beast. Dissecting its profile and coming up with tasting notes is not like having the elements line up and present themselves one after another, like some kind of surreal audition or a debutante’s ball. They arrive when and as they will, and as we sip and try and think, we understand it’s not important to catch every nuance, every last flavour; sometimes all that matters is the overall tone, the commingled experience. I may not be able to give you a complete set of tasting notes here: but the encounter as a whole is quite something. Aged in ex-bourbon casks. No information on where, but I think it was in Scotland. If you compare similar full-proofed, similarly aged rums from Velier to the TMAH, you’ll see the difference tropical aging makes. I really have no clue what TMAH stands for: Angostura never responded to me, and Cadenhead’s reps said they didn’t know. An anonymous online wit on FB –thanks, Cecil — said it stood for “Too Much Alcohol Here.” May his glass never be empty. Comparing the Cadenhead philosophy with that of the giants like Bacard and Diageo is a little like comparing Terrence Malik films with Michael Bay’s, or a haiku with Paradise Lost. 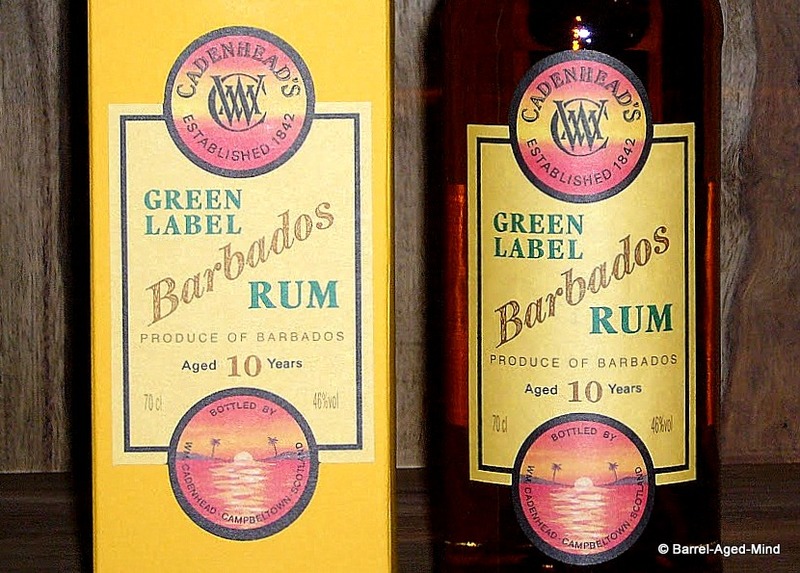 Instead of beating you over the head with all possible volume sold to the widest variety of consumers, Cadenhead is small, tightly focussed on its principles, and has vanishingly small sales of its rum product, which are all made with what seems to be a dour middle finger to the commercial rum establishment. Off the top of my head, I cannot think of a single commercial rum maker who takes this kind of minimalist, puritanical approach to making rum (unless it’s Bruichladdich with their Renegade line and the occasional Gordon & MacPhail offering and both have prettier presentations). I mean, Cadenhead seems almost aggressively indifferent to how the world at large reviews its rums. It’s like they say “Like it or lump it, laddie…we’ll keep makin’ it just like this.” That’s positively West Indian. 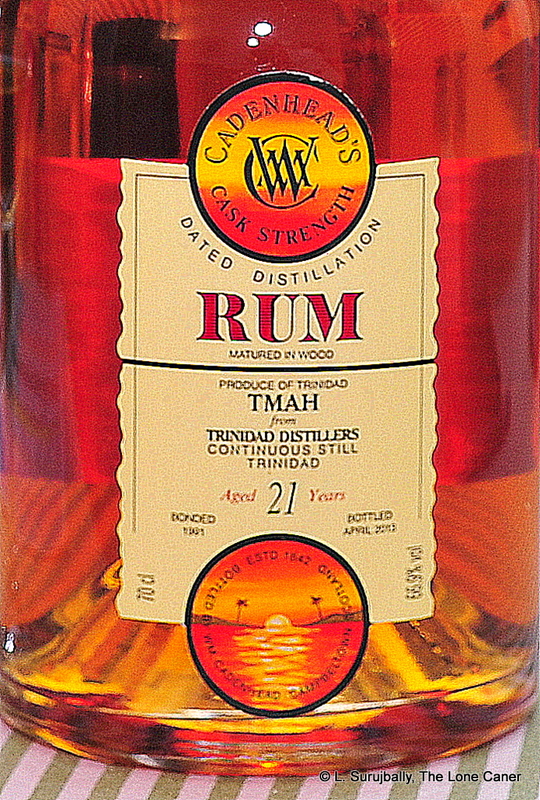 William Cadenhead & Co, now owned by J A Mitchell & Co of the Springbank distillery in Campeltown, have a reputed enormous stock of matured Demerara and other rums, and constantly replenish their wares through a rum broker to ensure continual supplies from obscure and not-so-obscure distilleries in the West Indies. They bottle one oaken cask’s offering at a time and then the “run” is done. My inquiries didn’t yield any answers as to which distillery in Panama was the source of the spirit, so we will have to remain in the dark on this one. However, one thing you can say is that Cadenhead don’t frig around with wussie forty percenters. They chuckle into their sporrans, shake their heads at the weakness of the young, and issue beefcakes of rum, then trumpet the fact long and loudly. 46% cask strength, bam. Sniff that, me son. The Panama 8 year old is pungent and deeply aromatic on a first assessment. 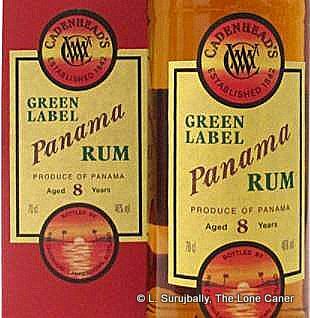 I noted last week that Kōloa Gold had a strange scent that one really had to work at to see it was a rum at all – Cadenhead’s Panama 8 is exactly the opposite, being very obviously a rum with an aggressive attitude redolent of burnt sugar, molasses, toffee, bonbons and perhaps allspice. There was little in the way of secondary, lighter (or “cleaner”) flavours, not that it needed them – this was a serious nose that didn’t have time to muck about. The medium bodied gold rum was also quite excellent on the palate. The arrival, as befitted a cask strength offering, was a shade sharp on the initial taste, and then mellowed out very nicely – then the dark burnt sugar, the caramel and nougat started to come to the fore; after opening up some more, other soft flavours began to gently emerge like little ballerinas not sure of their reception on the stage: vanilla, chocolate, a good wine-soaked cigarillo, the lightest perfume of flowers. And yes, before you ask, a bit of briny spice on the back end. The finish was long and lasting and wafts of chocolate, leather, tobacco and sugars fought genteely for dominance. After the odd non-specificity of the Kōloa Gold, I must confess to being very taken with this rum which had no time to pretend it was anything other than what it was. A rum, and a rough ‘n’ tough ‘un at that. What impressed me about the Cadenhead here was its depth. It’s difficult for me to put this precisely, but what I’m describing is a measure of the intensity and dark heat of the mingling flavours as they chased each other down one side of my nose, out onto the tongue and then up the throat. I’ve noted before that overproofs deliver a whallop of flavours a standard 40% rum just doesn’t – in this aged eight year old rum, the company has somehow tamed a raging spirit right out of the cask with nothing more than distilled water. A rum like the Panama 8 has to be approached with a certain mindset: there’s no point in thinking that this is a mixing agent or a sweet Caribbean tipple at a holiday resort. It is, on the contrary, a rum made by a whisky maker to an exacting principle best described as “keep it simple.” Panama 8 has no colouring or other additives, is not chill filtered, is as close to the output of a barrel as you can imagine – and therefore can truly be said to be an expression of what an unadulterated rum should be. This won’t find favour with many rum aficionados whose palates are accustomed to smoother, more carefully blended fare. But if you want to know what a rum is before a blender starts tinkering with it, then this is surely the place to start. Addendum: in 2010 I tried the 12 year old Demerara variation from Cadenhead and didn’t like it, scoring it low. I don’t have any of the rum left to compare against the Panama, but I stand by the score as it was back then. In fairness, given how much I like this one, the Demerara 12 may deserve a re-try to see if it’s me that’s changed, or the rum really was that unimpressive. A dry, slightly overproof schizophrenic rum that is just on his side of being a whisky, and not recommended for purist rum mixologists who like their libation darker and sweeter. Rum is traditionally matured in used bourbon or other whiskey barrels, but this is the first one I’ve ever seen and tasted which was finished in a Laphhroaig cask. Was that an accident? Did it just sort of slip and fall over and said “Oops!” as it boinked into a cask of whisky? I dunno, but Cadenhead Green Label 12 yr old Demerara rum is a rum with an identity crisis, a crazy overproof schizo that doesn’t know what the hell it is, and, like the Green Label Classic we tried way back in February 2009, it does not rank high on our list in spite of the $83 price tag. The source of this pale yellow rum is rum from Guyana (I wonder if DDL has been sneaking into Scotland again), and part of its claim to fame – aside from the aforesaid Laphroaig casks and some water brought in to bring it down (up?) to drinking strength – is an absolute lack of additives or subsequent processing of any kind to make it a different colour, or adulterate the taste in any fashion. This was also a charatceristic of the Green Label Classic we had last year, except in that case it had no age statement. 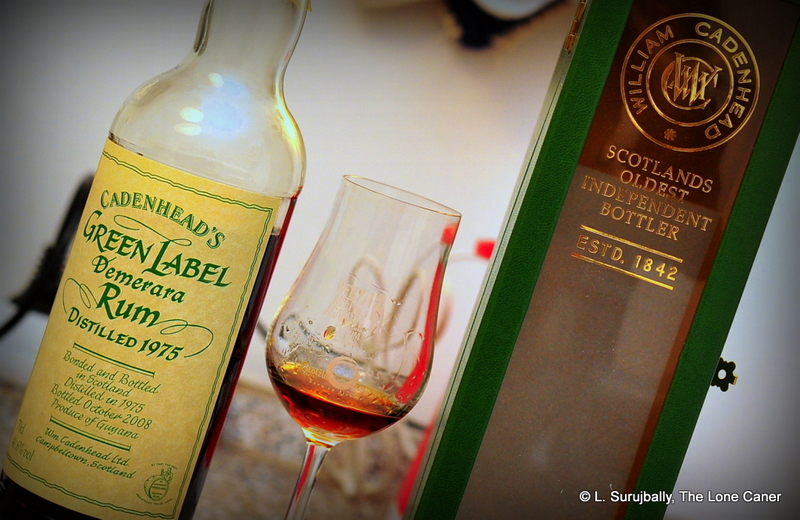 Both are made by the Cadenhead Distilleries now owned by the Campbeltown distiller J.&A. Mitchell and Co., which runs the Springbanks distillery in Argyll, and is primarily a single malt brewer. One is left to wonder whether they are copying Bruichladdich’s Renegade line, or indulging in some experimentation of their own. Appearance wise, the Classic was actually better, with a rounded cardboard box; this one was a fairly straightforward design and label of rough paper. A lot of the pale liquid inside was visible, and I imagine that alone would catch many an eye more used to darker hues. The nose is sharpish, not quite medicinal, but not gentle either (the rum is 46% so that’s certainly part of it), and asserts its woody character without apology. I’m not a whisky drinker by habit (I’ve tasted enough to get the rudiments down and one can’t be a member of Liquorature without picking up something about Scotches) and I have no real sense of Laphroaig aside from its peatiness – I imagine that the woody bite I got on the nose hearkens to this. It opens up after a while, revealing a fruity note, leavened by – I swear! – sea salt. Like I said…not a normal rum. The taste to me is flat out whisky. There is no way I could do a blind test on this and know it was a rum except, perhaps, for the slightly sweet hint to it which is uncharacteristic of whiskies as a whole. It’s dry as hell, as arid as the Sahara, and yet there again was that salty-brine undernote. It burns and stings of oak, finishes in the same fashion – dry and burning – and this is where I question the decision not to do any further processing on it. Aside from some kind of purist’s bragging rights, what exactly has this decision led to? Not a rum, to me, but some kind of bastardized in-the-middle product that isn’t fish or fowl. The PeatHeads in the group were vocally disapproving and dismissive – even contemptuous – in their assessment. “Motor oil.” “Rubber.” “Noses like a Barbie doll fresh out of the plastic,” sniffed the Hippie (how does he even know that smell? I wonder). I don’t know if they actually disliked it, smelled and tasted what they said, or were afraid that rums were starting to approach whiskies in taste and nose and were terrified of the thought, but to my mind the comments were just a shade harsh. Myself, I must admit to sort of liking it. Oh, don’t get me wrong, it’s not quite my thing, and I wouldn’t blow another eighty bucks to add it to my “special” shelf where I keep the stuff I really like (as opposed to those bottles I buy to review and share) – but there’s an odd underlying harmony to the balance of driness and sweetness in the Green Label 12; and the depth imparted by the slight overpoof nature of the rum added to a profile that I found just intriguing enough not to dislike it outright. Not quite recommended, unless you’re in the mood to buy something really different, but you won’t be entirely disappointed with it if you do. First posted January 19th, 2010 on Liquorature. 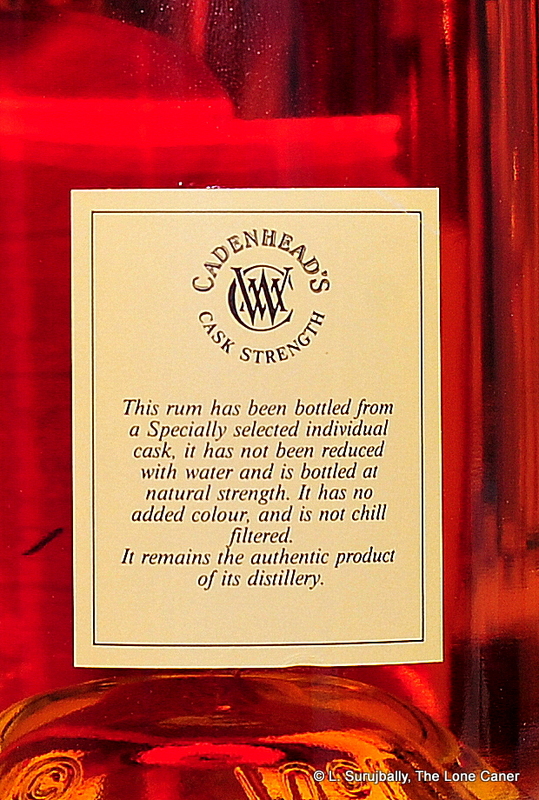 It looks like a rum and occasionally smells like one, but it sure doesn’t always feel like one; Cadenhead’s policy of making the Classic without any additives or subsequent filtering gives it a thinner body than the average and an overall whisky character that only a psychologist could unravel. Decent drink for those who like a little danger and strange stuff, though. This is as strange a rum as I’ve ever had, and was a selection of the November 2009 gathering, where nothing but rums were served, and it went head to head with two other rums: the Zaya 12 year old (and the winner by a nose, ha ha), and the Appleton Estate Master Blender’s Legacy (which was the most expensive and opined as the least value for the money). The Cadenhead Green, for all its ~$75 price tag, was considered middle of the road. It’s a strange one, this. For one thing, I have no idea how old it is. Nor am I entirely certain where it comes from, although I believe it is a Demerara rum that was then further refined in Scotland and watered down a tad to bring it down from cask strength. The website states it remains untreated and no additives brought in for either colour or taste, and its bold taste makes that likely to be true. 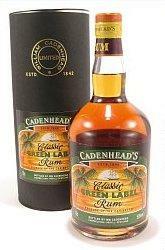 Cadenhead Distilleries is a scotch maker, not a rum maker (actually it’s now owned by the Campbeltown distiller J.&A. Mitchell and Co., which runs the Springbanks distillery in Argyll), but perhaps they took a gander at what good products came out of Bruichladdich’s Renegade line and followed suit. For whatever obscure reason, Cadenhead has chosen not to reveal the provenance of this rum (the “Demerara” appellation refers to the dark colour and body, not the source), but a few people on the internet have speculated it’s Jamaican, or possibly even Cuban – that would be illegal to market in America, so if anyone bought one of these in the US, I’d be interested to hear about it. It’s listed at 50% ABV, making it an fullproof Rum (I use the word “overproof” to denote rums that are insane for all practical applications…you know, like 70% and up). Did I like it? Tough question. I’ve made no secret of my dislike for distillers who refuse to put provenance or age on their labels – it’s too much like a cheat, giving the buyer no chance to make a first-pass determination of quality, or rate it against other, similarly-aged products – and that goes double for the higher priced babies, where a buyer needs to know what he’d forking out his dough for. Whisky – Scotch whisky – has its rules about what kind of hooch can bear the highland name, but the plebian and slightly disreputable origins of rum seem to mitigate against rum distillers doing the same. I admired the strength and character that the Green had, and its body was excellent. The strength stiffened the starch in its spine quite well and the complexity was admirable. So I’ll split it down the middle: I’d recommend it unhesitatingly for true rum aficionados who dislike adulterations, and dedicated whiskey drinkers (these are the guys who have their snoot glasses in one coat pocket, who sniff and sip and gargle and then rinse with distilled water). For more middle of the road folks I’d say “Give it a shot, for here is something remarkably different you won’t soon forget.” And for those who just want a decent mixer, I’d suggest getting something cheaper and sweeter to put into your cocktail. Fairer than that I just can’t be.